Grills with porcelain grates efficiently transfer heat to foods through direct contact of the food with the grate. 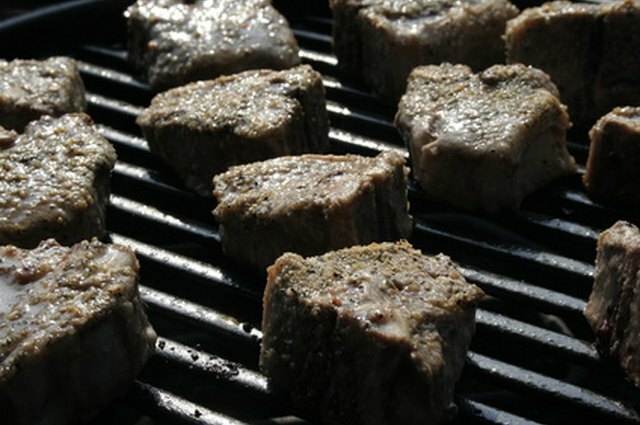 Properly maintained porcelain grates transfer added flavor to grilled foods because oils left on the grate from cooking fatty meats help a natural layer of seasoning develop on the grate. Initial seasoning of the grate, and proper use and cleaning thereafter, will ensure this layer of seasoning remains on the grate, and your grilled meats will taste even better. Turn the grill onto its highest setting and close the lid. Turn on all the burners if the grill you are using has more than one. Allow the grill to heat up for 15 minutes. Fold a paper towel in half five times to form a multi-layer pad. Grip the center of the folded paper towel with a pair of metal grill tongs. Dip the folded towel into vegetable oil. Lift the towel above the oil until it stops dripping. Turn off the grill. Rub the oiled paper towel on the porcelain grates. Cover both sides of each rung. Heat the grill on high for 30 minutes with the lid closed. Turn off the heat and reapply the oil. Repeat the 30 minute heating process. Cook meats directly on the hot oiled porcelain surface. Clean the porcelain grates gently with a brass brush while they are still hot. Close the lid on the grill after every use. Remove seasoning from porcelain grill grates by spraying them with water while they are hot. The steam releases the oils and makes it easier to scrub away the seasoning layer with a brush. Cover the seasoned porcelain grates with aluminum foil when cooking moist foods like vegetables. The steam they generate as they cook can strip away the seasoning. 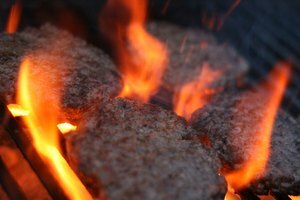 Should You Use Briquettes With a Gas Grill?